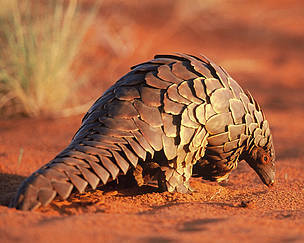 Almost every week there seems to be news of yet another big seizure of pangolins or their scales. Often in Asia, but increasingly regularly in Africa. 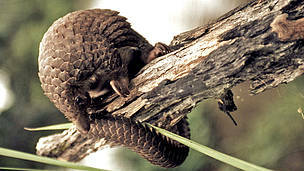 Photos often show piles of pangolins curled up into a defensive ball. Frozen. Heading for an illegal market somewhere in the Far East, where their meat is prized as a delicacy and their scales are used in traditional medicine. 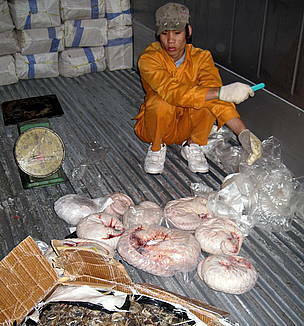 While shocking, there should be no surprise that crates of pangolins and their products are regularly intercepted by customs and other law enforecment officers. Over the past decade, despite all the focus on elephants and rhinos, the most poached and trafficked mammal in the world has been the pangolin. Estimates suggest that 1 million have been illegally trafficked and traded in the past 10 years. That’s 100,000 a year. The vast majority of which end up getting through and feeding the seemingly insatiable demand. And it’s not as if the world’s only truly scaly mammals are unprotected. All eight species are listed in Appendix II of the Convention of International Trade in Endangered Species of Wild Fauna and Flora (CITES). This is the second highest level of protection, which only allows carefully regulated international trade. Usually, this would mean that all exported pangolins and pangolin products must have export permits certifying that they were legally obtained, and that the exports are sustainable. However, since the year 2000, the four Asian species have been subject to a zero annual export quota for specimens removed from the wild and traded for primarily commercial purposes. This effectively makes international commercial trade in Asian species illegal, but it does not require importing countries to issue import permits for non-commercial imports, so that the burden of enforcement lies entirely with the exporting countries. And it is clearly not working. Asia’s pangolins are vanishing. The Chinese and Sunda pangolins are already critically endangered, while the Indian and Phillipine species are endangered – just one step further from extinction. It is time that all four species were placed on Appendix I of CITES, which would outlaw any international trade. This proposition is up for debate at the 17th Conference of the Parties (CoP17) to CITES in South Africa in September. It is a position backed by WWF, TRAFFIC, IUCN and numerous conservation organisations – and one that the 182 Parties should endorse. But Africa’s four species also need greater protection. As it becomes harder for poachers and traffickers to find sufficient Asian pangolins, they are increasingly turning their attention towards Africa and targeting the Tree, Ground, Long-tailed and Giant pangolin species found across the continent. 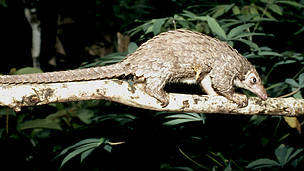 Indeed, between 2013 and 2015, scales from as many as 25,000 African pangolins were seized and there is evidence that hunting for pangolins on the continent has increased markedly in recent years and, given their low birth rate, this is very likely to have a significant impact on populations of all species. African pangolins are clearly at risk of following the Asian species into serious decline due to illegal trade. The world must also give them the protection they need at CITES CoP17. Along with uplisting all eight species to Appendix I, there are also a raft of rigorous measures up for debate that would enhance the international response to the trafficking of pangolins and are essential to ensuring the proper implementation the new listings. We strongly support these additional measures and hope that they will also be overwhelmingly endorsed.